I just couldn’t wait to share with you this sweet present that my parents sent us today. 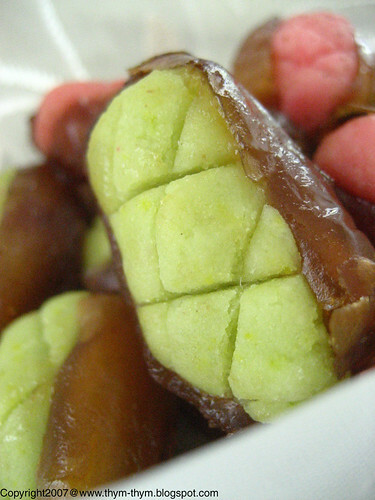 My favorite dates in the whole wide world: Algerian Deglet Noor Dates. To me, they are just the best dates ever: sweet and fingers sticky dates stuffed with my mother’s homemade almond paste. I am in heaven. My mother has been telling me all this week about the pounds and pounds of stuffed dates that she was making for my cousin’s wedding but I didn’t imagine a single minute that she had some made just for us. Now I will ask my hubby to hide them away because I can’t stop eating them. And because my mother knows how much I love cute boxes in all forms and shapes, she sent them in the cutest sugar box I have ever seen. Oh! And did I mention that my sister spoils me too with jam filled cookies, a cookbook and chocolate. I am in heaven. Just in heaven. Merci beaucoup maman et papa pour tout votre amour. Merci aussi ma soeur chérie pour ta gentillesse et ta générosité. Oh Rose, how could you tempt me like this - I love dates and I love homemade almond paste. Your mom's stuffed dates look soooo good. How wonderful that you received thoughtful gifts from your mom and sister. You deserve to be spoilt! With these sweet treats, your weekend is certainly turning out to be a good one. What a lovely thoughtful gift! u lucky girl ...! i usually have mine stuffed with the whole almond but the paste looks wonderful too.And that too i see a generous portion in there.hAVE to try this one. How lovely for your family to think of you and spoil you, enjoy - they look yummy and well popable! I absolutely adore dates but have not sampled these. I really must! - Nora, you are too sweet. I would have been more than happy to share my dates with you if we lived close by. - Aimme, you are absolutely right. Panforte! !sounds delicous. - Nikki, it was very lovely indeed. Thank you. - Kate, Whole almonds works very well too. I also like to stuff it with Brazilian nuts or walnuts....yummy! - Thank you very much Kelly-jane. - Ce fut un regal Claude. Merci et bonne semaine. - Truffle, you should really try this variety of dates. They are the best. You just don't know how your post and this picture touched me today. My grandmother passed away 2 years ago today and dates stuffed with homeamde marzipan were her favorite treats to make and eat. One of the many food items she brought back with her from Morocco and Algeria. Parents are the greatests, aren't they?!! Anonymous, The pink and green colors are, I think a very popular choice. I am Algerian, and my mother made them for my wedding too. When people were arriving she would hand them a date to each and every one of them as a welcome gesture. In both our cultures, dates have a very precious status and that's one of the many thigs that I am proud to have. I love dates. I can never get enough of them. Unfortenutly, here in Michigan, I cannot find dates like the ones we have in Algeria: Deglet el Nour. There are other varieties, especially the ones from Saudi Arabia. So my mother is sending me another Arjoun of dates very soon, and I can't wait!